The spring term is in full swing. Inspired by Sheila Fitzpatrick’s writings on identity and imposture in Tear off the Masks, I decided this time around to read with my students a series of texts on imposters in pre-reform China. To the comedies of playwrights Lao She and Sha Yexin, I added a handful of police reports on actual imposters. 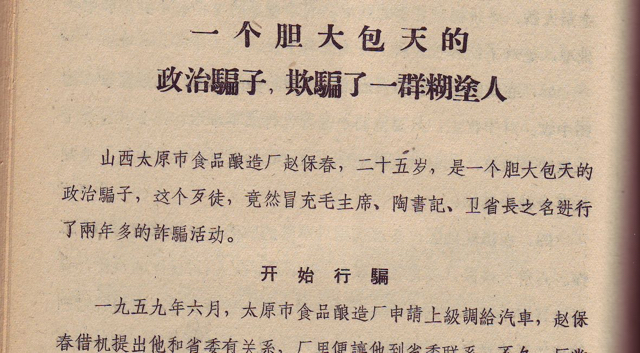 One is a brief account in a newsletter put out by an arm of the Shanghai Municipal Revolutionary Committee concerning a “mixed ancestry” or Eurasian girl (pretending to be Tibetan), surviving on the streets of Shanghai in 1967. Another is a longer account by China’s public security organs of the exploits of a twenty-five year old con artist from Suzhou during the Great Leap Forward. Our Document of the Month for March 2015 deals with yet another imposter, and it started out as a report from the Shanxi provincial public security organs. In its present abbreviated form, it appeared in the Central Ministry of Public Security’s Public Security Work Bulletin and describes the amazing rise and fall of a bold working class hero by the name of Zhao Baochun. Much of the time, the twenty-five year old Zhao merely pretends to be politically rather better connected than he really is. His gullible factory superiors, in turn, prove only too happy to accept his stories about knowing personally the Shanxi governor Wei Heng and about talking on the phone almost daily with the provincial first secretary Tao Lujia. One time, Zhao even successfully impersonates the CCP Chairman asking to be connected long distance straight from Tiananmen Square, and our Document of the Month includes a transcript of the brief conversation that is supposed to have ensued! Today Mao may be dead – or so many China watchers believed until last month, when the Asia Society in New York published a recent letter from him – but the Audacious Bold Chinese imposter evidently still thrives. In fact, he appears to have gone global!